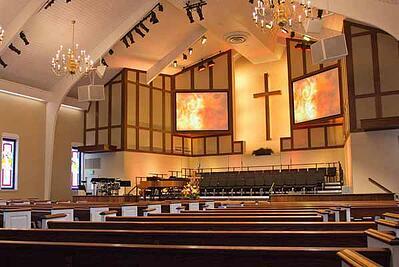 Trying to find pricing information on a new church sound system online is challenging. 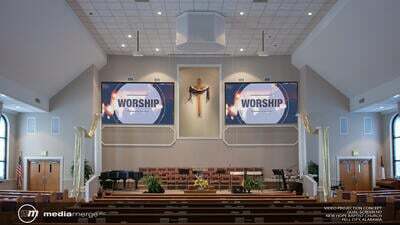 One of the first questions almost every worship pastor asks us is how much does a new church sound system really cost? Although this can be a tricky question to answer, this article will provide realistic pricing examples and guidelines to help you along the way. Using labels related to worship style can be a little dangerous. The terms often used are very subjective and can be loaded with emotional and political baggage. For the purposes of establishing cost guidelines, the following definitions will be used to help you align your particular presentation style with the appropriate budget category below. Contemporary (Advanced) - These systems include multi-channel concert-quality sound with controls designed for experienced, high-skill users. Systems will typically include a large number of stage inputs, top-tier digital console, top-of-the-line loudspeakers, a large number of personal monitor mixers (PMMs) and high-end digital wireless mics. Ancillary systems may include multi-channel recording, distributed audio, assisted listening and broadcast audio capabilities. Contemporary (Blended) - These systems include stereo concert-quality sound with controls designed for moderately experienced users. Systems will typically include a large number of stage inputs, mid-tier digital console, top-of-the-line loudspeakers, a moderate number of personal monitor mixers (PMMs) and mid-tier digital wireless mics. Ancillary systems may include multi-channel recording, distributed audio, assisted listening and broadcast audio capabilities. Traditional (Blended) - These systems include mono sound with controls designed for less experienced users. Systems will typically include a moderate number of stage inputs, entry-level digital console, mid-tier loudspeakers, four stage monitor mixes and a few mid-tier digital wireless mics. Ancillary systems may include stereo recording and limited distributed audio. Traditional - These systems include mono sound geared primarily for speech reinforcement with controls designed for inexperienced users. Systems will typically include a small number of stage inputs, entry-level digital console, mid-tier loudspeakers, up to two stage monitor mixes and a few mid-tier digital wireless mics. Ancillary systems may include recording and very limited distributed audio. These factors can be very subjective and may introduce substantial fluctuations in pricing. After defining these variables, four separate approaches can be applied to arrive at useful budget numbers. The most accurate method uses comparable projects as the baseline for ROM pricing. The remaining three methods provide good budgetary rules of thumb. DISCLAIMER: Once again, it's important to note that a wide range of factors can profoundly affect the price of a church sound system. The figures provided below are intended to provide a budgetary guideline to help your church begin the conversation. Do not use these estimates for establishing a final budget. 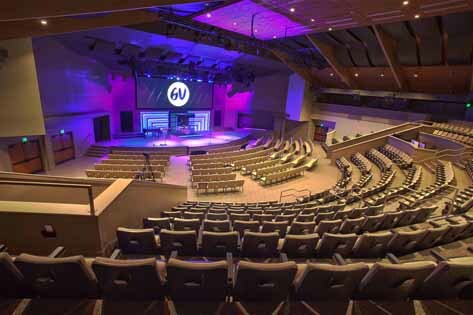 The most accurate single methodology for determining the cost of a new church sound system incorporates cost comparisons of recently completed projects that are similar in scope to your project. This option is rarely available to your church's team outside of the involvement of an AVL integrator. Because it requires detailed records from multiple completed systems, most churches will have to enlist professional help to pursue this budgeting approach. For new construction projects, Percentage-of-Construction-Budget is a useful metric to develop a budget guideline. This approach is widely used by consultants to provide budget placeholders to architects during the early phases of a construction project. There are a number of challenges related to this approach, namely that construction price variations and selected finishes can greatly affect the cost of a facility. These differences can produce swings in the final budget range, however, this methodology can be useful for gauging the potential cost of a new church sound system. The ranges provided below were developed by compiling standards from industry resources and cross-referencing them with actual completed project costs. Cost-per-seat is a widely used metric in the industry to develop a budget guideline. There are a number of challenges related to this approach, namely that pews, chairs and theater seats all provide different densities of seating area. These differences can produce swings in the final budget range, however, this methodology can be useful for gauging the potential cost of a new church sound system. The ranges provided below were developed by compiling standards from industry resources and cross-referencing them with actual completed project costs. Estimates created from this approach tend to run on the lower side of final system cost. To calculate the number of seats, include only the seating in the congregation area. Do not include choir seating or other seating on the stage platform. Also, do not use maximum capacity figures provided by the fire marshal or code offices. These numbers are typically inflated beyond actual realistic seating capacity. 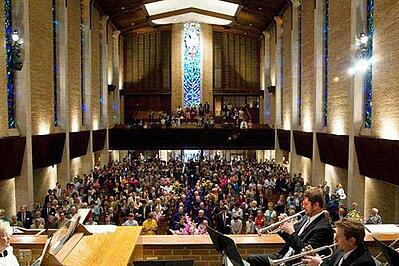 This number may be well expressed by your maximum Easter Sunday attendance in a single service. Multiple the number of seats by the cost-per-seat provided below to determine an unqualified budget range. Cost-per-square-foot is a metric more aligned with the architecture/construction the industry approach to budget development. There are a number of challenges related to this approach, namely that the size of the stage area can affect budget results. These differences can produce swings in the final budget range, however, this methodology can be useful for gauging the potential cost of a new church sound system. The ranges provided below were developed by compiling standards from industry resources and cross-referencing them with actual completed project costs. Estimates created from this approach tend to run on the higher side of final system cost. Determine the square footage of your facility by measuring the entire public area of the facility (Sanctuary, Worship Center, Chapel, etc.) including seating areas, aisles, balconies and stage. Multiple the square footage by the cost-per-square-foot provided below to determine an unqualified budget range. Design/Bid Process - Hire a consultant to design the system and then hire an AV company to install it. You may be able to negotiate a lower price on the equipment, but you pay the overhead of two separate companies. DIY - You design it and build it. You also assume all of the associated risks. Local Music Store - Guitar Center, Bailey Brothers - This may be the best option for smaller churches with very basic needs. Whether you decide to hire an AV company or take a different route, we hope this blog helps you better understand how to determine an estimated cost for your upcoming church sound system upgrade. Contact Us if you have any questions or leave a comment below.